Here we show you how to make a simple mallet out of a single log. Long ago, when our ancestors worked woodlands more intensively, tools had to be made on the spot. Travelling coppice cutters and charcoal men would often make simple tools where they were working, instead of carrying them around from place to place. 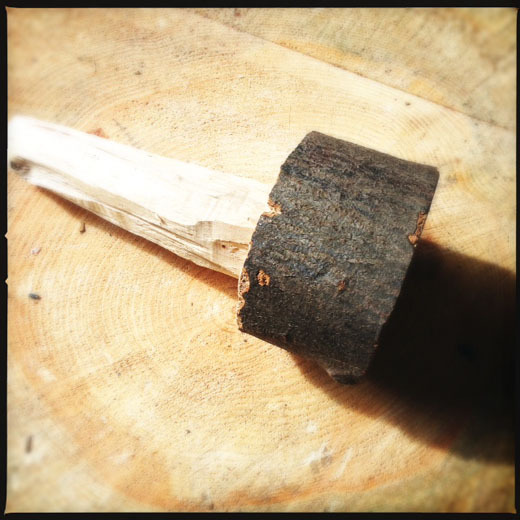 Mallets are useful for splitting wood, knocking in wooden tent pegs and bashing stuff. 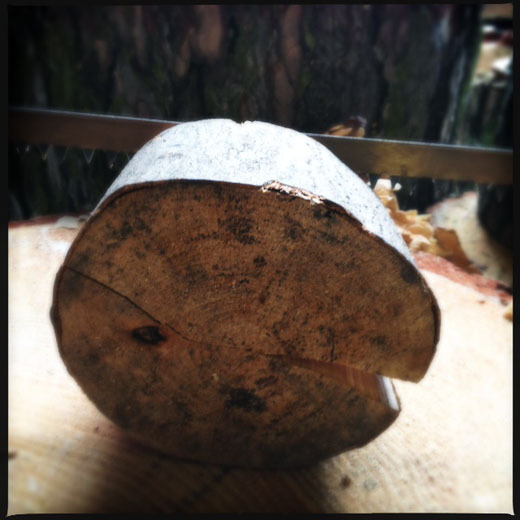 An unseasoned (freshly cut) log: about 30 cm long and 12 cm in diameter. Most woods can be used – in our case we had an oak log at hand. The only difference between hard and soft woods is that hard woods take more time to shape. The softer woods, like pine, are easier to work but being softer means they will suffer damage easier when you bash them. Chopping block or a stable hard work surface. About half way along the log, cut all the way around the circumference to a depth of just under 5cm. 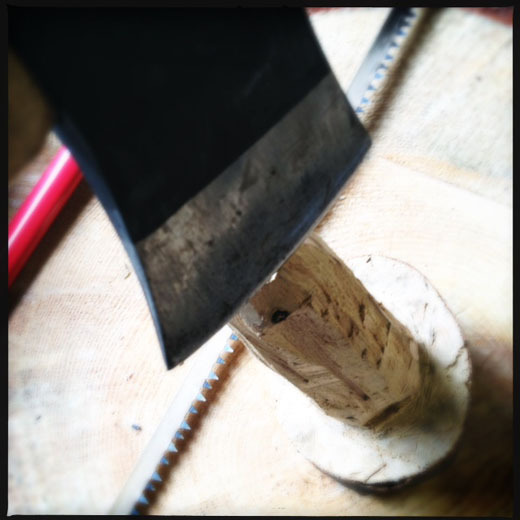 From the narrowest end of the log, use the axe to shave off along the grain down to the saw cut. Keep working and shaving slivers off all the way around the log until you have a round handle the right size for your hand. Smooth the handle and make it as round as possible with some sandpaper or a sharp edged stone. You could also try splitting off one side of the head to provide a flat surface for hitting dowels or chisels.